In the course of a Reiki treatment, I often pick up information about the client which I usually share afterwards. The specifics for each individual can be wildly different from week to week. (If ever we needed proof that we are not the same person moment to moment, here it is!) When something I pick up seems a little far out or illogical (i.e., no history of that with this client), I feel a bit timid about sharing the information. Such was the case with L. recently. "Weak in the knees," I told her. "I kept hearing that phrase, "weak in the knees." "Wow," she exclaimed. "My son's been having knee problems. He might need surgery, and it's been on my mind," she explained. "That blows my mind." "Oh, and there was something going on in your sinuses." She stopped and turned toward me. "You're kidding!" she said, wide-eyed. I told her about the sinus clearing I felt happening as I worked on her head. "Okay, now I have to tell you about this morning." She proceeded to share the details of a distinct yet uncharacteristic sinus event that had taken place a few hours previous at a business meeting. L. found this correspondence of my sensations to her experiences quite remarkable. She walked away shaking her head in amazement. On another day, it was E.'s brain that was especially prominent in the treatment. The left side felt shriveled and much smaller than the right. This didn't make sense to me, and nothing like it had ever turned up in any of her previous sessions. Still, what I'd sensed was very distinct, so I shared it. The look on her face confirmed it made sense to her. She proceeded to tell me of her son's brain deficits--on the left side--and the current legal struggle they were facing related to his disabilities and circumstances, which she was troubled about. In each of these cases, was the situation receiving Reiki? the client? or the client's son? Was E. experiencing "sympathetic shrinkage"? Was L. developing weakness in her knees by focusing on her son's weakness? I don't know. Had these questions come up during the treatment, I might have looked or asked for the answers. But what matters in my view is that in all cases, what needed treating got treated. I love this about Reiki energy: it knows where to go, and goes there. It knew J. had a heaviness in the heart and went there. It rooted out C.'s self loathing and went there. It showed me V.'s High Priest energy, and M.'s eight-year-old self--all in service to the client and what he or she needed at that moment in time. Recently, not long after the earthquakes and tsunami in Japan, P. came for a treatment in Braintree. The music playing during her session, selected by a fellow practitioner, sounded Japanese to me. I thought maybe it had triggered the remarkable experience I had while treating P., so I didn't share it with her. But then she remarked about it as she got up from the table. "Oh, that music," she said, and touched her heart. I decided to tell her what had happened. As I treated P., I felt the unbroken link of being--all humanity, all life. It felt very clear and very logical to me, as it was happening, that I was c onducting a healing treatment for Japan. I felt the Reiki--concretely and actually, not conceptually or metaphorically--reach the Japanese people and land. P.'s eyes filled with tears, and she started nodding. "That was my intention when I got on the table," she told me. "I wanted some of this to go to them." "Well, it did," I said. And it had. In no uncertain terms, it had. This is the intelligence of Reiki. This is the power of intention, of thought. This is the function of a clear channel. What a beautiful and wonderful thing. I gasped when I opened up to the Decorah eagle cam this morning. It snowed! The birds are looking ragged, wet and cold. The little ones still looking liked plucked chickens (albeit very cute plucked chickens) keep scrambling for cover and warmth under their mother. I had been wondering how it would be for them in a rainstorm up there. This was my answer: hard. It looked harsh and hard for them. I'd seen "Ma" buffeted by heavy wind--late last night, for example. That looked challenging enough to bear. But 31 degrees F and wind and snow has her looking both exhausted (she must've been up all night) and, it seems to me, concerned. This is Nature, this is natural, right? Sometimes it snows on the nest. I can't possibly have thought these birds wouldn't have to face harsh elements up there 80-odd feet in the air. Still, I feel that I am learning something this morning as I watch them. Ignorance is bliss, they say. I can't really know what happens in an eagle's nest until I see it, now can I? I am seeing it now. I am watching mother eagle, day in and day out, caring, scouting, preening, protecting, feeding, hunting, sleeping, fluffing, patrolling: vigilant, careful every minute. Even while sleeping she is on alert, ready for anything. For many weeks now she has been engaged, with the help of her mate, in the annual ritual of hatching and raising her young. Each day for a couple of weeks I have watched her perform her duties without complaint. Compound the task by adding snow to the mix: a threat, it occurs to me now. A true threat. Can she feed them? Might they freeze? Mustn't she feed them? This is what I am thinking as I watch these raptors undergo their travail. Up flies the father to deposit a fresh-caught fish. But my attention is on mom and the eaglets, still concerned for them. Out of the corner of my eye, I think I see the fish flap. Mother eagle confirms that I did. She takes its head in her beak a moment. Then she pokes at it a couple of times. I don't want to be watching what I'm watching. Can I be watching what I'm watching? Its gills, its mouth are gasping for water. Yes, dear. This is what happens in an eagle's nest. Since forever. 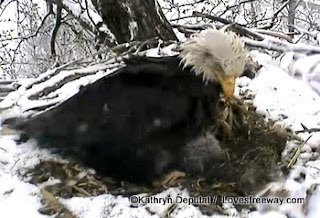 Mom stands and begins feeding the fish to the eaglets. I am grateful the bulk of her body is blocking my view. I know what's going on, and I know it's natural, but I still feel for the fish. That fish is being eaten alive! By reflex, I have put up my hand to send it Reiki. I know exactly what the energy will provide for its passing over, and I want to provide it. All the while, I am aware that Nature does Its thing every day--just this sort of thing--and has done so for eons without my help. I realize what I'm not watching is natural. Natural, yes, but cruel--no? Nature is cruel. Yes, Nature is cruel. I have seen other evidence that it is so. It is strange to discover as this all unfolds before me that I think I should be exempt from undergoing. I must think so, because I seem to think the eagles should be exempt. But sometimes it snows on the nest. I stand reminded, and grateful for it. Nothing in Nature is exempt from undergoing. 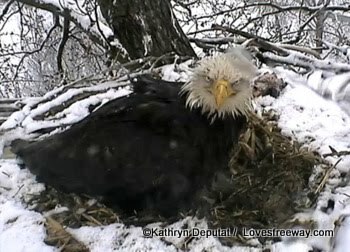 And sometimes it snows on the nest. April is Poetry Month! If you haven't already, you might want to sign on to Knopf's Poem-a-Day for the remaining weeks. You'll find delights like this one below in your email box--a nice way to start your day, or accompaniment for the lunch break, or a companion to your afternoon or evening tea... or "tea." Enjoy. We asked Edward Hirsch, whose collection Special Orders is now out in paperback, to comment on the title of the poem below. He writes, "The French novelist Henry de Montherlant coined the maxim, 'Happiness writes white,' which suggests that happiness is a blank that can't be described. It simply doesn't show up on the page. My poem playfully but urgently responds to this idea, a common romantic prejudice, by showing that happiness, too, can be written ('I am a piece of chalk,' 'I am a banner of smoke'). Joy, too, is part of life and can be precisely described." that crosses the blue air and doesn't dissolve. In Decorah, there is a newborn still being as if tucked in its shell though its shell has hatched. There is a fresh hare on the nest: rabbit paw, cotton tail. There is wind, much wind, and vigilance: two more eggs and a newborn to keep warm. Then later, much much later, there is mother tucking her head down for sleep and the breathing of feathers: only the breathing of feathers. It feels miraculous to watch, to be privy, to be intimate with the eagles in their nest. And tonight, with Japan in mind, what's going on over there, I feel keenly the purity of Nature. The perpetuity of Nature, unflappable and enduring. I feel deeply privileged and grateful for this window onto time and immortality. I feel entrusted. Responsible. Custodian. And I feel. Sure. There is nothing more important than this that I am watching: Life giving way to Life, immortal.